This week before the New Year is the best time to plan for the coming year to make it uniquely special and fruitful for you. This is the time to use your imagination to create that perfect year for you, to make plans to get you where you want and dream to be and to follow through with these plans. It is our responsibility to make our lives the best they can be. I believe that we are co-creators, creating the life that we desire through our thoughts, choices, and actions with the help of the omnipotent energy of the universe which some of us call God. So its time to ensure that we are on the right path to our success. We must take the right actions and commit ourselves to making our lives the best they can be, not only for our own personal sake, but since we are all connected to each other, the choice of one influences the lives of all that are on this planet, so it is our responsibility to be our best. You can achieve the health and weight you desire this year. If you can visualize it in your mind and take the right action steps and choices, it will -sooner or later become your part of your reality. I truly know it’s fun to eat cakes, cookies, and sweets, just as it may be fun to smoke cigarettes for some of us, but we must think whether these choices will bring us closer to our goals, dreams and lifetime desires. Yes, they are fun, yes it’s more fun to eat some whipped cream, some rich fatty cheese, and a 500-gram steak, these are fun NOW, but their consequences are devastating to our future, our future generations, and our planet. If you are still confused about what you should be eating for true health, disease state reversal and easy, natural weight loss, check out my book based on my Ph.D. research project about the healthiest diet for humans. I also wanted to know what was right for me to eat, and whether we all needed the same kind of diet or if we each have different needs. Through my meticulous research of all scientific fields together, I found the answers i was looking for. I personally reversed my own disease state; I got rid of my addictions, I am full of energy and naturally lost all of my excess weight. All of my conclusions are available to you in my book The Guerrilla Diet & Lifestyle program available on Amazon in the link below. You always have a choice. Remember Newton’s Third Law? It states that for every action there is always an equal and opposed reaction. Each action of ours will lead to a definite result in our lives, very simple. So choose successfully for a more promising life because the choices you make now define you and create your future and the future of those you hold dear. I wish you a Happy New Year and a very prosperous year ahead! Thank you for taking the time to read this and watch the video. If you are serious about improving your health no matter what your age or circumstance are, and are ready to achieve better results with your weight loss attempts, guaranteed, then join my mailing list where you will receive my weekly newsletter with groundbreaking health, motivational content, recipes, supplement recommendations, easy workouts, as well as many FREE bonuses and special offers. Click HERE to subscribe. 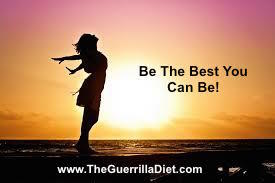 Or visit the Guerrilla Diet Website for my health advice, offers, programs and free information HERE.